Three kinds of structures or apparatus for baking, smelting, etc., were known to the ancient Hebrews: (1) the oven for baking bread; (2) the potters' kiln for firing earthen vessels; and (3) the furnace for smelting metals and ore. The modern heating-stove was unknown to the Hebrews, who used braziers and fire-pots instead. 1. The oven for baking ("tannur") was a necessity in every household, the trade of baking not being developed till later, and probably then only in the large cities. Several families may have used a common oven, a practise that still obtains. Pictures found on Egyptian monuments indicate that the ovens which were formerly used in the Orient resembled, on the whole, those now in use (see Erman, "Aegypten," p. 269; Wilkinson, ii. 34). The tannur is a large clay cylinder or jug, standing upright, with a small mouth at the bottom, the fire being lighted on the ground beneath. The dough, as nowadays, was always kneaded into flat, round cakes, and was put on the cylinder as soon as the latter was hot. Among the ancient Egyptians the cakes were placed on the outside of the cylinder. In Palestine at the present day the fire is allowed to burn low, and the dough is then placed on the inside of the cylinder while the coal and ashes are still glowing. This may also have been the custom among the ancient Hebrews. Such ovens have been found at Tell al-Ḥasi (comp. Bliss, "A Mound of Many Cities," pp. 114 et seq.). For illustrations of modern ovens see Benzinger, "Arch." p. 86. 2. The potters' kiln is mentioned only in later times (Ecclus. [Sirach] xxvii. 8, xxxviii. 34). Thistardy mention, however, is merely accidental. The firing, probably also the glazing, of earthenware was practised very early by the Phenicians, who perhaps taught the handicraft to the Hebrews at an early time. Nothing is known of the arrangement of this kiln, or of that of the large kiln ("malben") used for firing bricks (II Sam. xii. 31; Jer. xliii. 9; Neh. iii. 14). 3. 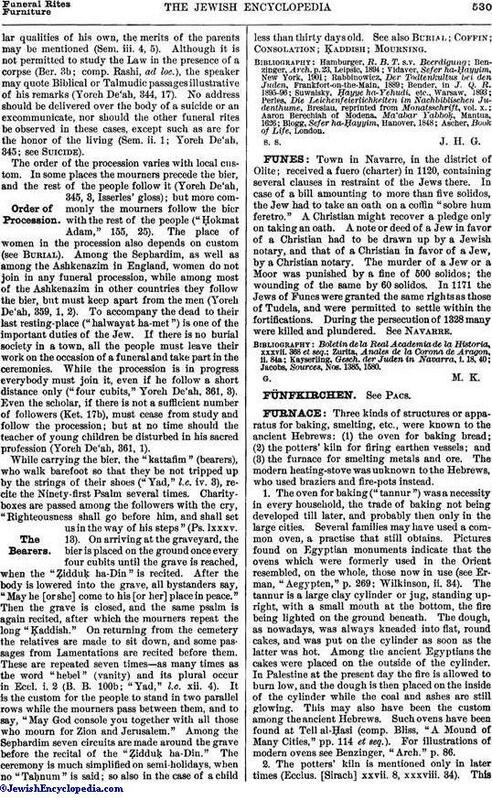 The Hebrews never practised smelting, as their country produced no ore; but they were acquainted with the process through their neighbors in Lebanon, where ore was mined. The large furnace for smelting was well known to them, and is frequently used as a metaphor. The Hebrew metal-workers, however, had smaller furnaces and crucibles; but, although various names have been handed down, it is not possible to distinguish between the different kinds referred to. "Kibshan" (Gen. xix. 28; Ex. ix. 8, 10; xix. 18) seems to designate the large furnace belching forth volumes of smoke. "Maẓref" is the goldsmiths' crucible (Prov. xvii. 3, xxvii. 21). "Kur" is likewise used for melting and refining gold (Prov. xvii. 3, xxvii. 21; comp. Wisdom iii. 6) and silver (Ezek. xxii. 18-22; Isa. xlviii. 10), but the same term is also used to designate the "iron furnace" ("kur ha-barzel"); i.e., the furnace used for smelting iron ore (comp. Metals), always metaphorically employed to describe great trouble and misery (Deut. iv. 20; I Kings viii. 51; Jer. xi. 4). The term "attun" occurs only in a single passage, in the story of Daniel (Dan. iii. 6 et seq. ), and is used to denote the large furnace into which Daniel's friends were cast. It was a furnace for smelting, open at the top to admit of the ore being thrown in (comp. verse 23), with a mouth at the bottom for the escape of the molten material (comp. verse 26). 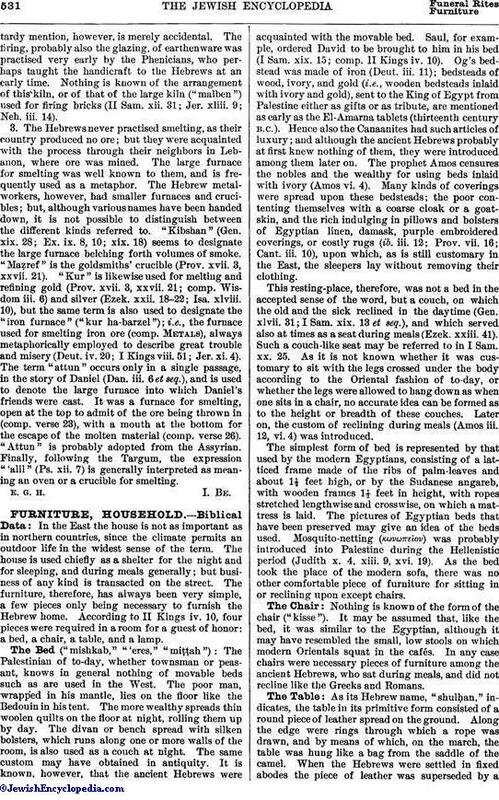 "Attun" is probably adopted from the Assyrian. Finally, following the Targum, the expression "'alil" (Ps. xii. 7) is generally interpreted as meaning an oven or a crucible for smelting.